Alternative Energy, LLC > Air Conditioning > How Much Do Solar Panels Cost In Arizona? The average cost of solar panels in Arizona is $24,500. Arizona solar panels costs range from $20,000 to $30,000 across the state in 2019. This is before tax incentives and rebates. After incentives and rebates, this makes the average cost of solar in Arizona $15,500. Want a more specific estimate about the cost of solar panels in Arizona? Use our Arizona solar panel cost calculator to get a more realistic estimate based on your annual kilowatt hours of electricity used in your home. To understand the true cost of solar panels, one must know how the cost is factored in the first place. The cost of solar panels is dependent upon how many watts of power your home uses multiplied by the current cost of solar panels per watt in the State of Arizona. The average home in Arizona uses around 7,000 watts or 7 kilowatts in 2018-2019; with the average cost of solar panels per watt in Arizona being around $3.50 per watt; this makes the average cost of solar panels in Arizona around $24,500. That amount includes materials and installation costs. On the other hand, if the intent of your search was looking for solar companies in Arizona – Alternative Energy, LLC offers the lowest solar panel installation cost in the entire state of Arizona! Get a free solar quote by filling out the short quote form for a free estimate. 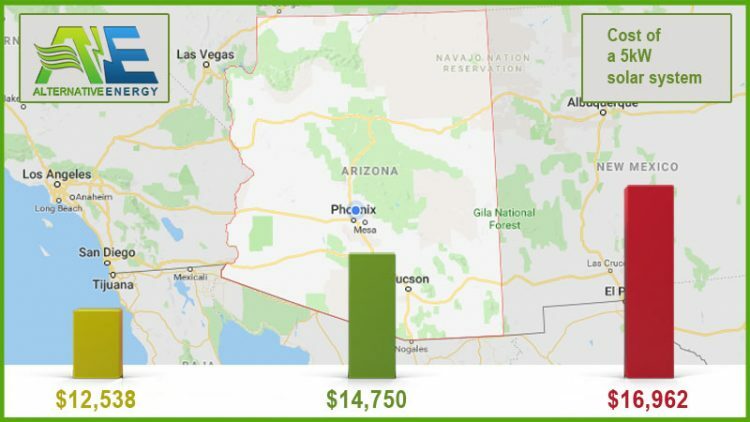 The range of solar panel installation costs in Arizona are between $17,000 – $52,200. Putting the average solar system cost in Phoenix, Arizona right around $24,500 for a 7 kilowatt residential solar system. Estimates are based on installing a 7 kilowatt solar system (average sized solar system), at a rate of $3.50 per watt. The solar panels and installation are included in these estimated costs. Low Cost: $20,000, AVG Cost: $25,000 and High Cost: $30,000. Alternative Energy, LLC Offers Affordable Solar Panel Installation In Phoenix, Arizona & More! We’ve cracked the solar code in Arizona! Alternative Energy, LLC is proud to announce that we offer the most AFFORDABLE SOLAR PANEL INSTALLATION in Arizona. We offer some of the best solar deals in Phoenix Arizona. We can get you started with solar panel installation for $0 down payment when you finance. No one can beat No Money Down Solar Panel Installation. NO OTHER SOLAR COMPANIES IN ARIZONA CAN BEAT OUR PRICES because we install more than just solar panels. For example: Our competitors will offer you a high priced solar system for around $30,000 to cover your inefficient energy usage, while, our company on the other hand, will only charge you $20,000 for a smaller solar system and other energy upgrades. WE can also help you maximize your Arizona solar rebates and tax incentives. Alternative Energy, LLC ensure TOTAL HOME COMFORT, while our competitors only offer solar. 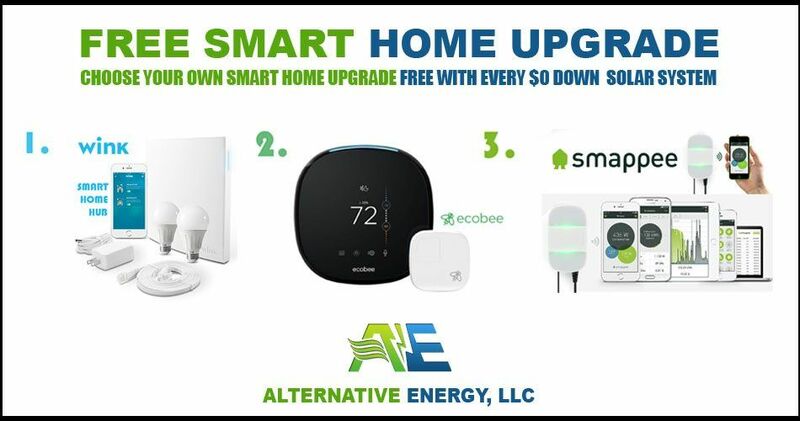 Both decisions will save you 99% on electricity but choosing Alternative Energy, LLC means your home will be more comfortable too! Fastest Install times in the Industry Guaranteed!! Low profile racking for best look. How Much Does Solar Cost Per Kilowatt In Arizona? How Much Can You Save With Solar Panels In Arizona? How Long Does It Take To Pay Off Solar Panels In Arizona? Going with the popularity of the solar cost question, we decided to do some research for our homeowners and managed to gather some great information from all over the internet, putting together all the costs of operating solar panels in Arizona into one post. We hope that the following information is helpful. So lets get into it… What will it cost to have solar panels installed on my house in Arizona? Furthermore, if you need solar panels in Phoenix, give Alternative Energy, LLC experts a call today at (480) 744-1803! How Much Does It Cost Per Kilowatt For Solar Energy In Arizona? The cost per kilowatt for solar energy in Arizona is $3.50 – $5.00 per watt, much lower than the national average cost. Although, just because solar is so cheap doesn’t mean you should just go out and buy the biggest and baddest solar system thinking it’s going to save you the most money, it won’t! I thought installing solar panels helps save money? Well, you’re right… sort of, but hear us out. Depending on the size of solar system you need, the cost per wat will be based on the system size. For example: The way you figure out how much you system is going to cost is easy. The average sized system in Arizona is around 7 kilowatts, (7 kilowatts = 7,000 watts). 7,000 watts multiplied by $3.75 per watt, as we can see in the chart below, would cost you $26,250 (7,000 watts x $3.75 per watt = $26,250). *These costs are based off financing solar panels, if you pay cash for solar, you can take off $.50 cents per watt across the board. When Arizona was developed, most settlers were using design plans based off east coast/midwest construction methods. These plans did not include 120 degree temperatures, dry air and always sunny days. Arizona homes and business are not built correctly for this hot/dry climate and most homes and facilities have major inefficient energy problems forcing them to purchase larger air conditioning units than they need. Most solar companies are going to try to sell you a large solar system based on your high energy and A/C usage, when more importantly you need to solve your high energy usage problem first. Alternative Energy, LLC noticed the energy inefficiency problems with most Arizona homes and business and decided that instead of selling you a larger solar system, make the rest of your home or business more energy efficient first. Everything from installing insulation and radiant barrier to wrapping your air ducts with SRX and installing mini split systems. That way you only pay a few thousand dollars on energy efficient upgrades that save you $10,000 – $20,000 dollars by only installing a smaller solar system. How Much Do Solar Panels Save On Electricity Bills In Arizona? You can save as much as 97-99% on electricity by installing solar panels in Arizona. Most homeowners in Arizona see a 20 year savings solar energy savings of $25,000 by installing solar panels. Although, you are going to pay a steeper cost to do so if you ONLY decide to install solar panels. Your home or business is most likely very energy inefficient and it doesn’t make since to pay such high costs for solar when all you need a few energy efficient upgrades and a small solar system to save even more. The biggest problems with most homes in business in Arizona are lack of insulation and radiant barrier solutions. Also, even the homes and businesses that are taking advantage of radiant barrier aren’t doing it correctly. Current radiant barrier technology fails time and time again once dust is introduced to your attic leaving it ineffective to reflect heat. This means it stops working! This means you are no longer saving money from that investment. Then when you decide to call your insulation contractor he says that he can’t help you, there are no guarantees with radiant barrier! We want to change that! Wouldn’t it be nice if there was a new radiant barrier technology that actually worked, wasn’t affected by dust and came with a money back guarantee to save you at least 50% on electricity? Well, you’re in luck! We just happen to have patented radiant barrier technology that isn’t affected by dust, actually works to save you up to 50% on electricity and comes with a lifetime guarantee to keep working forever!! Not only that, but now that your home or business is more energy efficient, you will only need to install a smaller solar system, saving you thousands more than installing solar panels without energy efficient upgrades. What Is The Average Electric Bill With Solar Panels Installed? The average electric bill with solar panels is about $35 which is your solar utility payment. This is assuming you installed a large enough solar system to cover your energy usage during any time of the year. How Long Does It Take To Pay Off Your Solar Panels In Arizona? The U.S. Department of Energy says that solar systems will only take about 5 years to pay for themselves. However, many of the areas throughout the U.S. Will find that solar payback time will only take 3 years. Any electricity that your solar system generates after the amount you have used is considered to be a long-term savings on your part. For the residents in Hawaii, this will come to as much as $64,000 over a course of as little as 20 years. According to the U.S. Department of Energy, a solar electrical system is going to raise the value of a property, making it worth $20 dollars for every $1 dollar made with the utility savings in a one year period of time. What this means is that a family that has a 3kW solar system will automatically be adding a value of $16,720 to their home, all because the solar panels were put on their home’s roof. This has been based on the first year of savings the family had, which was $836 dollars. Furthermore, you can look at all the solar tax incentives to see for yourself that solar systems literally pay for themselves. Around 30% of the total costs involved accounts for solar panels alone. Residential solar panels that are combined with a 3 – 8kW capacity cost between $17,000 – $52,000. Just because a solar panel has a high price on it does not mean that it is any better than one that is cheaper. To judge the cost of solar panels the best way to go about it is to use the method of cost per watt ($/W), and it happens to be more convenient. The metrics will indicate the cost that is related to the electrical output. If you buy solar panels in industrial quantities, you can get them at a cheaper price than you could a decade ago. Currently, in industrial qualities they are being sold at $0.70/W, to translate this for home owners, it means $1.5/W. Everything except the solar panels themselves is referred to as a balance of the system (BoS). Which will usually include at one or more inverters, wiring and all other electrical components, and mounts. Another 20% of the total cost (balance of the system (BoS). These components will cost between $3,000 – $10,000 dollars. The inverters are used to convert direct current (DC) from the solar panels coming through an alternating current (AC) and is what a home uses to run appliances and etc., and it is what allows your home to be able to grid-tie your system. Now then, 10% of total costs account for the inverters used, which in this case come to between $1,000 – $4,000 dollars. Solar panels will typically come with a 20 to 25-year warranty, however, the conventional central inverters are going to need to be replaced much sooner than this. You can choose which inverter you would like to use between the micro-inverters and the central (string) inverters, Note: that the micro-inverters will boost the amount of power is used as well as the cost, and also an extended warranty. This section consists of labor costs (15%), permits, inspection fees (15%), These percentages depends on the locations, however, is usually between $2,000 – $5,000. Get the building and electrical permits at the Department of Building. The requirements of the neighborhood. Be approved by the Home Owners Association. You may get lucky and get an installer that can help you out with the information you need to know about permits in your area, this is the reason we recommend hiring an installer from a larger company is always the best. Operational costs between $4,000 – $8,000 (20%), includes maintenance, repairs, monitoring, insurance, and overhead costs. Financial incentives make the solar market look good – whether there is any sunlight in the area or not! The final amount you end up paying for a solar system depends a great deal on the location you live, rebates available, tax credits available, and if you are eligible for any grants (if so, which ones?). There are some situations where the total costs may be cut more than 50%, making it possible for homeowners to own one for only a few thousand dollars. The Federal Tax Credit applies to everyone, which is at a staggering 30%. Several of the incentives have been capped at a specific power, with a cost threshold. We usually recommend a system size which is going to maximize the potential of caps and cost thresholds. Solar panels, these convert the energy from the sun to make the electricity. Controller, regulates the flow of electricity, protecting batteries. Batteries, electricity is stored for later use. Inverter converts the energy that’s stored into the needed voltage for running standard equipment. It is not just one of the components that drive up the cost, but the entire system. Note: After a period of tie the batteries need to be replaced. However, it’s expected to be seeing the cost to continually go down once the film panels are made available to the residential market, but for now, they are only being sold to commercial customers. It is in the works for Nanosolar and AVA Solar to boost up their production facilities. We will be able to see how the price targets turn out, they may be available in volumes many times today’s output, meaning they may be at $1 – $2 dollars per watt. That is if the cost of installation and equipment is reduced closer to $1 dollar per watt, making the 5 kW system cost only $10,000 dollars, with the payback time down to only 10 years, even if there are no subsidies. Solar system installations would then be more appealing. But, for this to work out, electricity costs would have to stay constant. If there is a continuation in the rise of fuel it will also make the payback period shorter. For now, you can expect to be noticing more and more solar systems being on rooftops. The average cost of commercial solar panels depends on the number of kilowatts you need to cover your energy consumption. Generally speaking, the average cost of commercial solar panels is about $325,000. Costs ranged from $50,000 to $600,000 in 2018. Want To Learn More About Affordable Solar Panels In Phoenix, Arizona? Get A Free Solar Installation Quote! Alternative Energy, LLC is a full-service Energy Company offering residential and commercial energy improvements including patented radiant barrier technology, Solar panel installation, residential solar panels, commercial solar panels, load controller installation and more. Get a free affordable solar panel installation quote and figure out how much your solar panels will cost. Contact Alternative Energy, LLC today to find out how we can save you 50-100% on electricity for much lower than the price of installing a large solar system. Give us a call today at (480) 744-1803, we look forward to speaking with you! Our Solar Panel Installation Service area includes the all major Arizona cities including: Phoenix, Tucson, Mesa, Chandler, Glendale, Paradise Valley, Scottsdale, Fountain Hills, Gilbert, Tempe, Carefree, Cave Creek, Peoria, Surprise, Yuma, Avondale, Flagstaff, Goodyear, Lake Havasu City, Buckeye, Sedona, Flagstaff, Kingman, Goodyear and more. PAY NOTHING DOWN! Over the past several years’ people have been purchasing Solar panels using the method of ‘Power Purchase Agreements’ (PPA’s), ‘Third-party-owned’, and ‘Pay-as-you-go’ solar. These models are to reduce upfront costs. It is their arrival in the past several years that has helped them grow. It is now possible for homeowners to have solar and pay nothing down, generating savings from day 1. The way that leasing works is instead of having an electricity bill to pay, you would be leasing a solar system, paying only a fixed rate for the electric that gets produced, being cheaper, and that rate can be locked in for up to 15 years. Pingback: Are Solar Panels Worth It in Arizona? Hey there. Could you use more buyer/seller leads? No thank you sir. We get all of our Solar leads from organic SEO through Erick The SEO Guy.